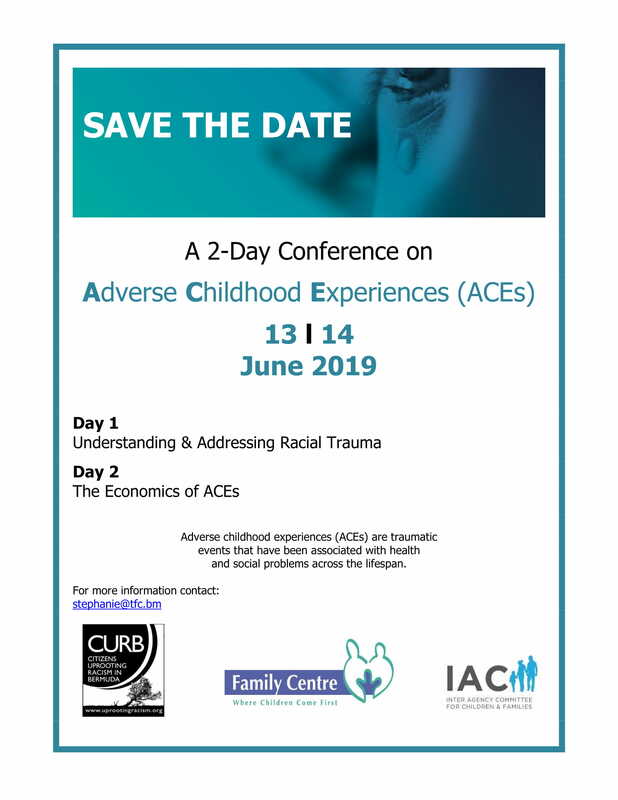 This year on June 13 and 14, Family Centre, in affiliation with the Inter-Agency Committee for Children and Families, presents its second annual ACEs Conference to educate the Bermuda public on Adverse Childhood Experiences (ACEs) and their long-term effects. The 2 day conference will focus on Understanding & Addressing Racial Trauma and the debilitating hidden wounds associated with it, and The Economics of ACEs – the high cost of ACEs on individuals, families and the community. Family Centre, along with the Bermuda Health Council, are currently conducting research on ACEs in Bermuda, and plan to present our findings at the ACEs 2019 conference. The ACEs survey is open to all adults who spent any part of their childhood in Bermuda, and is currently accepting responses. The 2019 ACEs Conference will follow up on last year’s event, which was targeted to healthcare and social service professionals, and now speaks to the effects of ACEs on employees and their families, and by extension, ACEs’ effects on the economy. Additionally, an entire day of this 2 day conference will be dedicated to understanding and addressing racial trauma. Racial trauma is a vital topic that needs to be explored in the Bermuda context. The subject was touched on briefly at the 2018 conference, and followed up with Family Centre’s ongoing ‘Shedding Light on Blind Spots within Therapeutic Relationships’ workshops. Family Centre are proud to lead the way in addressing this issue head-on, and we thank Citizens Uprooting Racism in Bermuda (CURB) for their partnership and assistance in this endeavor. The goal of the conference is to provide a day long experiential opportunity for all members in the community to participate and learn about the anatomy of racial trauma and the associated hidden wounds associated; moving from a place of dialogue to action and healing. Strategies for unmasking and countering racial trauma will be addressed. Day 1 – Understanding & Addressing Racial Trauma is presented in partnership with Citizens Uprooting Racism in Bermuda (CURB). The aim of the conference is to bring together business leaders, insurance professionals, policy analysts, and key stakeholders to share the science behind adverse childhood experiences (ACEs). The business community will gain an understanding of how childhood trauma could translate into low productivity, high turnover, sinking morale and rising health care costs. Our goal is to strengthen cross-sector collaboration and explore ways we can work together to promote greater awareness of the potential impact of ACEs on business productivity. Audience: Business leaders, insurance providers, donor community, policy analysts, social service providers, educators, human resources managers, and other professionals. Please contact Dr. Stephanie Guthman if you would like to get involved with the ACEs conference in any capacity, including promotion of the event, volunteering at the event, and presenting at the event.